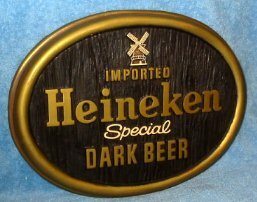 Heineken Special Dark Beer foamboard; 13 1/2 x 10 inch, foamboard sign with hanger on the backside. Letters and windmill are raised from the simulated wood plaque. Great shape.